Robotics education has often been taught using build-it-yourself kits such as LEGO® Mindstorms® Education EV3. There are now more advanced robotic platforms, such as the Baxter robot, which are able to be used throughout all stages of education, teaching, research and to actual practical application. The gap between robotics learnt throughout education traditionally has been vast and for many years, there hasn’t been a standard platform throughout education for robotics based teaching, research and outreach. With numerous ways to code robots such as C++, Python and ROS, often students, teachers and researchers alike can find themselves having to relearn programming over and over in between projects. However, there are now smart, collaborative robots for education available at a low cost. Baxter can be multi-purposed across roles such as teaching, outreach and research as there is no need to re-boot, re-install or modify the robot for different users and with the inclusion of the mobile pedestal, Baxter can be easily wheeled in and out of lecture theatres or labs. The free, open source Gazebo software means that students can maximise precious lab time. By setting offline programming tasks with the Gazebo simulator, students can work at home and then use the same code to test Baxter in real life. With Gazebo being open source there are no re-curring license fees for the University or the students which makes the value of Baxter even better. The Baxter robot can also be used as a great outreach platform thanks to its ‘wow factor’, with Baxter’s flexible ease of use and inherent safety features it can also be used safely by children and adults alike. There is a need for STEM education within the field of robotics and engineering to fill the shortfall of engineers and plant operators within the current workforce. With automation increasing in most industries globally there is an increasing shortfall of qualified workers to operate, maintain and install these automated industries. For most Universities the main reason for not providing industrial focused education was due safety concerns of having a caged robot within close proximity to students, as well as the lack of floorspace to house such machinery. The advantage of the Baxter robot is that it is truly collaborative and isn’t just a lightweight, slower, cageless industrial arm. Baxter can work intuitively alongside students and researchers without the fear of injury due to inbuilt safety features such as the Series Elastic Actuators and Force Control Sensing. Pretty much anything which runs Linux can be integrated with Baxter and a researcher’s favourite is the Xbox Kinect camera which provides Baxter with a low-cost, off the shelf depth vision camera. By being able to add 3rd party products and output internal readings and metrics, users gain access to an incredible variety of information. Baxter runs on the standard ROS framework, but can also be programmed using C++, Python and software such as MoveIt and MatLab meaning that no matter what language you programme in, you can work with Baxter. Baxter benefits from having a manufacturing twin which exactly the same component wise meaning that any practical solution found using the research version can be applied in a real-world environment using the exact same robotic platform. 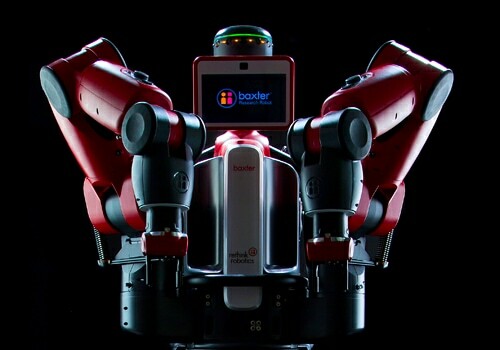 There are currently numerous Universities around the world working on solutions to everyday problems using the Baxter robot. Bank Breaker or Budget Beater? Affordability is one of the key barriers to educational establishments and it was the vision of Rodney Brooks, founder of Rethink Robotics, to create an affordable robotic solution which can be used safely alongside people for learning and research. Baxter benefits from efficient production techniques and economies of scale to provide the best possible value for money knowing that your investment is a long term one. Through utilising one standard platform across teaching, research and outreach savings can be made by using Baxter across multiple departments thanks to its variability and advanced specifications. Educational establishments who utilise low-cost smart, collaborative robotic solutions can provide a higher learning experience for their students enabling them to further themselves professionally post-education. Through being able to use a smart, collaborative robot in a safe educational environment, students get a more hands on experience and researchers can interact on a higher level with their research. Smart, collaborative robots for education are extremely versatile, they can be used across departments and across functions, from teaching to outreach. Robots like Baxter are here to provide a teaching platform for the next generation of robotic engineers. As there is also a manufacturing version of the Baxter robot, and numerous other robots also use the same programming language, the learning experience can be applied in a practical application in the workplace. Active8 Robots understands how important it is to make robotics and technology accessible to our younger generation which is why we have developed a School Workshop Scheme and have a dedicated School’s Outreach Team who specialise in providing exciting and informative robot days. These workshop days enable students to work with the latest robotic technology which students will learn to program throughout the day. Workshops start from as little as £350 +VAT. Learn more about Baxter and its capabilities.